One of the perks of being a blogger is that you often have your finger on the pulse of what’s new…thanks to being consumed with your blog and constantly on social media. Because of my obsession, I discovered that there’ll be a new restaurant in town. A sister restaurant to Veggie Planet, Veggie Galaxy will open at the end of the month nestled in the heart of hipster haven, Central Square in Cambridge, MA. The soon-to-be-opened diner will feature vegan and vegetarian versions of comfort food as well as a vegan bakery. Wait, a vegan bakery?? I’ve been waiting for this for years! Now, I won’t have to schlep to NYC for freshly baked vegan desserts! So a few weeks ago, I had the pleasure to attend their vegan Sneak Preview Tasting Menu, along with a bunch of other lucky tasters (yay me!). At the tasting, Head Chef Brian Van Etten talked about the diner décor which will consist of sloped ceilings and chrome fixtures, accommodating 88 hungry patrons. He wanted to design a menu of “rock-solid food” that was accessible to everyone, not just vegans and vegetarians. Lesli Turock, Veggie Galaxy’s Pastry Chef & Bakery Manager, shared her interest in creating vegan desserts as a challenge as she’d never done so before. Like Brian, Leslie also wants her confections to delight a wide audience. So even if you weren’t there, I’m going to let you in all the yummy secrets so you’ll feel like you were there, scarfing everything down too. We started our meal as you would start your day…with breakfast! The first dish I ate was the incredibly sumptuous Griddled Banana Nut Cream Cheese Stuffed French Toast with Caramelized Banana Butter. Warm cinnamon and creamy banana, a comforting combination, swirled around crispy bread. The only problem was that the bread was a little hard to cut. But it was so delectable, I didn’t even care. The French toast was accompanied by a pungent Strawberry-Basil Topping, adding depth of flavor. Sweet strawberries and the peppery yet minty freshness of the basil balanced each other perfectly. But the star of that dish was the Banana Butter. Slightly smoky sweet creamy goodness…mmmmm! 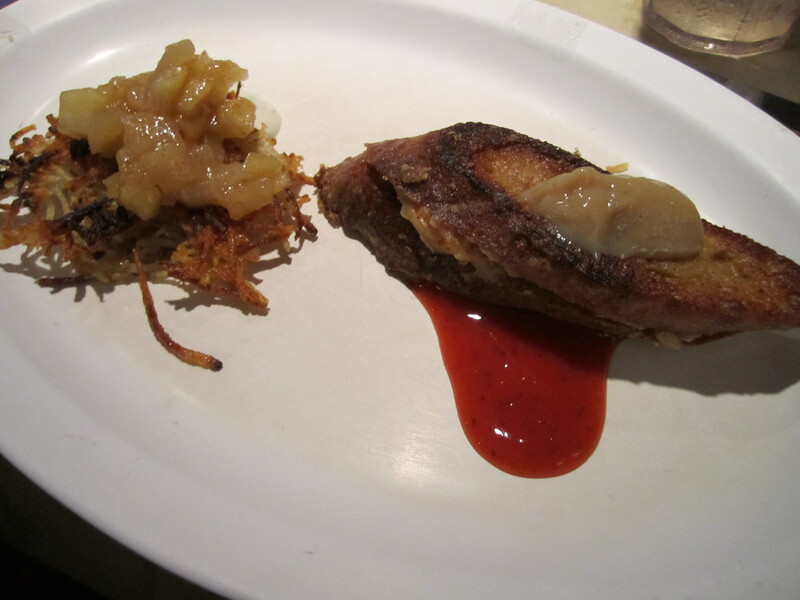 The next breakfast dish was a crispy fried Potato Pancake with Dill Sour Cream and Spiced Apple Sauce. Sweet yet tart apples and earthy potatoes, both hearty ingredients combine nicely here. Slathering the aromatic dill sour cream (um dill…yes, please! And it’s so creamy…you’ll swear it’s not vegan…but it is!) over the crispy hash enhanced everything. Omg…SO delicious. I could have easily eaten about 10 of these. Next came the lunch dishes. There was a Smoked Tofu Reuben Sandwich with Sweet and Sour Pickled Cabbage, Basil and Horseradish Russian Mayo. Now, I’ve never eaten a Reuben, a sandwich of corned beef or pastrami with Swiss cheese, sauerkraut and Russian dressing, in my life. That doesn’t even remotely sound appealing to me…well, maybe the cheese. But this vegan version was pretty good. The tofu had a wonderful smoky scent and flavor. But the texture was just meh. The mayo was pretty tasty too and I don’t even like horseradish! But the star here was the bread…amazeballs! 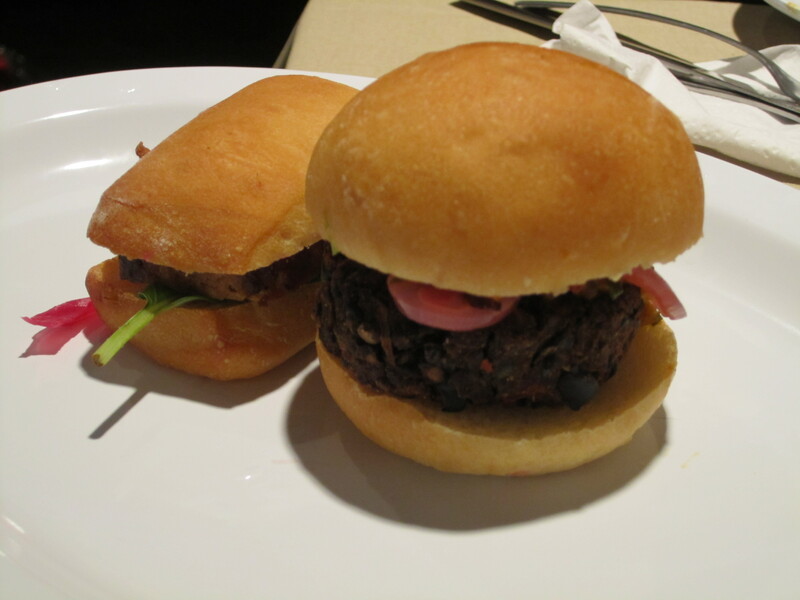 The second lunch dish was a Chipotle Black Bean Burger with Sweet Corn Mash, Tarragon Basil Pesto and Pickled Red Onions. Now, I’m usually not a huge fan of veggie burgers. They’re usually dry and tasteless or a sloppy wet mess. But this hearty bean burger had a fantastic texture – not too dry and not too mushy (I sound like the Goldilocks of veggie burgers here!). The pesto, a fusion of licorice-tasting tarragon and peppery sweet basil, was divine and the corn salsa packed a kick of flavor. 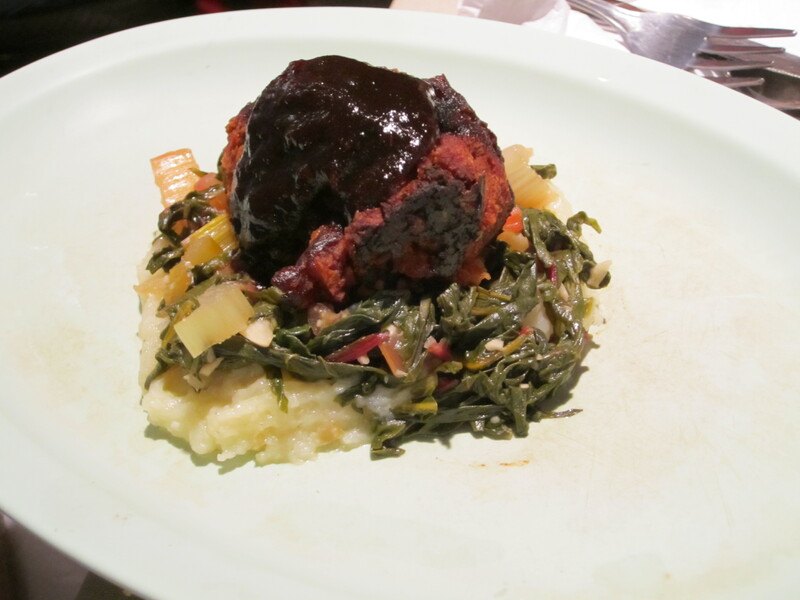 For the entrée, we ate a Housemade Seitan Meatloaf with a Smoky Balsamic Glaze, Sautéed Bright Lights Chard and Roasted Garlic Mashed Potatoes. While the smoky sweet yet tart glaze was yummy, it couldn’t save the meatloaf, which had a good texture bur for me was just okay. Although to be fair, I’m not a huge fan of seitan (except for Candle 79’s) and I’ve never liked meatloaf). But the bright lights chard, named for its visually stunning and vividly colored stems, was tasty. And those creamy garlic potatoes…OMG, they melted in my mouth. I didn’t eat them, I inhaled them. And no for the piece de resistance! Remember how I told you that Pastry Chef Lesli wanted her desserts to not taste good for vegan desserts but just taste fab? Oh, how FAB-U-LOUS those desserts are! 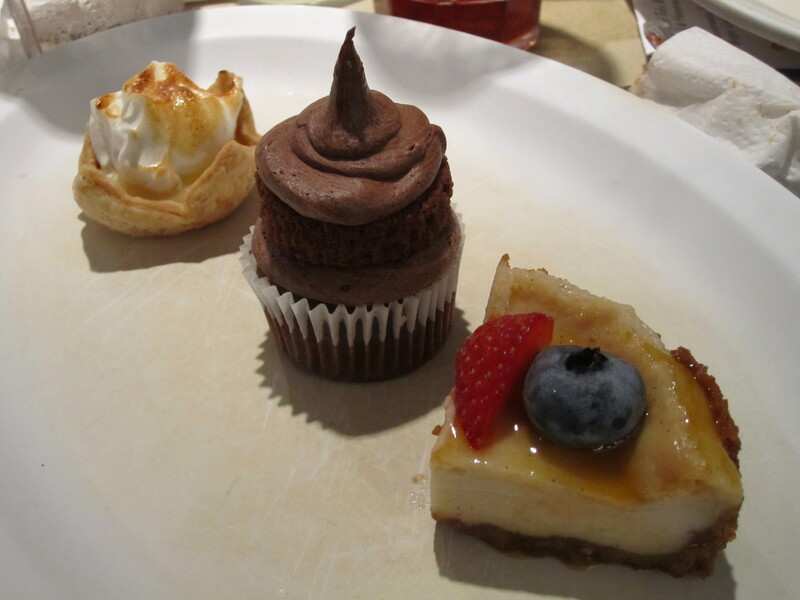 For the tasting finale, we nibbled on 3 vegan treats. The first was a Chocolate Layer Cake with Taza Chocolate Frosting. For those who don’t know, Taza is a chocolate factory in Somerville, right outside of Cambridge and Boston. They make organic, stone-ground Mexican chocolate…and it’s vegan!! It’s so delectable; you bite it and it possesses a subtle grainy texture yielding a slightly bitter yet sweet taste melting in your mouth. I try to keep Taza Vanilla Chocolate in my pantry at all times but alas, I gobble it up too quickly! So this moist, dense yet fluffy chocolate cake with a dollop of chocolate mousse topped with creamy chocolate frosting made from Taza…SOOOOO sinfully decadent and delicious! As a side note, I also ate Veggie Galaxy’s luscious Taza Chocolate and Butterscotch Pudding, not here but from the Taste of Cambridge (thank you to my two co-workers Nai and Sara for smuggling it out for me to try!). The second dessert was Lemon Passionfruit Meringue Pie. Okay, I don’t know how the hell Chef Lesli did it. Vegan meringue? Whipped confection with perfect peaks?! It’s not possible!! Oh, but it is…and it’s absolutely wonderful. The buttery shortbread crust, a burst of sweet passionfruit custard topped with a pillowy cloud of meringue…heaven! But the final dessert, a Vegan Cheesecake with Seasonal Berries, is hands down my favorite. Now, I love cheesecake. No, I don’t think you fully understand. I love, love, LOVE cheesecake! But I haven’t eaten a truly good cheesecake in 5 years, since before I was vegan. While some have come close, I’ve never eaten a vegan concoction that truly captured that rich creamy texture. Well, my vegan and lactose-intolerant friends, here it is, what you’ve been waiting for! Made with Tofutti cream cheese infused with fresh ingredients like vanilla bean pods and lemon zest. A crumbly graham cracker crust houses a creamy, dreamy cheesecake, made from Tofutti cream cheese infused with aromatic and sweet vanilla beans, combined with a tart and tangy lemon zest glaze. Simply TO DIE FOR! Well, there you have it! A preview of some of the amazing dishes you can order at Veggie Galaxy. So whether you’re a vegan, vegetarian or just craving comforting tasty food, when you’re in Boston, this is a must-see (and must-eat!) restaurant. Tags: Boston, Cambridge, restaurants, vegan, vegetarian, Veggie Galaxy. Bookmark the permalink.